Mark's Tickets is the best place to find tickets for Atlanta Braves fans. Just check this page for any new events or schedule updates throughout the year. We sell tickets to every Atlanta Braves game around the world. We know how passionate Atlanta Braves fans can be about baseball, so we make sure to have hundreds of tickets for every game available right up until it starts. For those looking for cheap Atlanta Braves tickets, we offer tickets starting at very low prices (many times below face value). 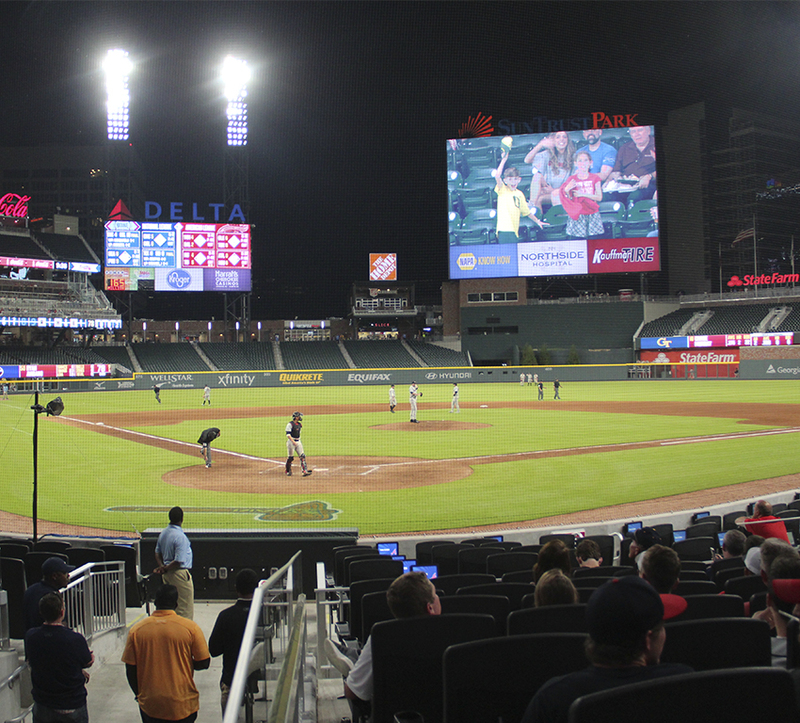 We offer tickets in most sections of every venue that you can see Atlanta Braves. Simply choose the city or venue that you are interested in below, and you will be able to see all of the available seats. Do not forget that Marks Tickets also specializes in sold out Atlanta Braves tickets. No longer will sold out shows prevent you from seeing Atlanta Braves. The Atlanta Braves are a professional baseball team that plays in the MLB. The Braves play their home games at Turner Field in Atlanta, Georgia. With 162 games per year, and 81 being home games, The Atlanta Braves are a Major League Baseball (MLB) team in Atlanta, Georgia, playing in the Eastern Division of the National League. The Braves have played home games at Turner Field since 1997 and play Spring Training games in Lake Buena Vista, Florida. The "Braves" name, which was first used in 1912, originates from a term for a Native American warrior. They are nicknamed "the Bravos", and often referred to as "America's Team" in reference to the team's games being broadcast on the nationally available TBS from the 1970s until 2007, giving the team a wide fan base. From 1991 to 2005 the Braves were one of the most successful franchises in baseball, winning division titles an unprecedented 14 consecutive times in that period (omitting the strike-shortened 1994 season in which there were no official division champions). The Braves won the NL West 1991–93 and the NL East 1995–2005, and they returned to the playoffs as the National League Wild Card in 2010. The Braves advanced to the World Series five times in the 1990s, winning the title in 1995. Since their debut in the National League in 1876, the franchise has won 16 divisional titles, 17 National League pennants, and three World Series championships—in 1914 as the Boston Braves, in 1957 as the Milwaukee Braves, and in 1995 in Atlanta. The Braves are the only Major League Baseball franchise to have won the World Series in three different home cities. The club is one of the National League's two remaining charter franchises (the other being the Chicago Cubs) and was founded in Boston, Massachusetts, in 1871 as the Boston Red Stockings (not to be confused with the American League's Boston ). They are considered "the oldest continuously playing team in major North American sports." There is an argument as to which team is actually older, because, although the Cubs are a full season "older" (formed as the Chicago White Stockings in 1870), Chicago did not sponsor a White Stockings team for two seasons due to the Great Chicago Fire; therefore, the Braves have played more consecutive seasons. After various name changes, the team eventually began operating as the Boston Braves, which lasted for most of the first half of the 20th century. Then, in 1953, the team moved to Milwaukee, Wisconsin and became the Milwaukee Braves, followed by the final move to Atlanta in 1966. The team's tenure in Atlanta is noted for Hank Aaron breaking Babe Ruth's career home run record in 1974.